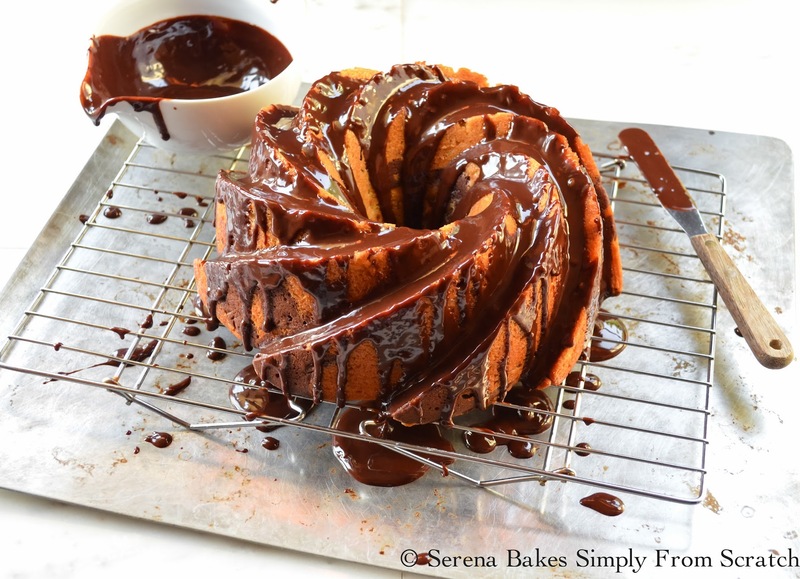 I made this Buttermilk Marble Bundt Cake With Chocolate Glaze yesterday after Colt accidentally erased the pictures for a Roasted Shrimp Greek Orzo Pasta I had planned for you today. OMGosh I was devastated because I'm trying to be more consistent for you guys and I thought I might finally be getting ahead again. But it was the perfect excuse to make a cake for the family because who doesn't love cake and the kitchens always been my stress relief. 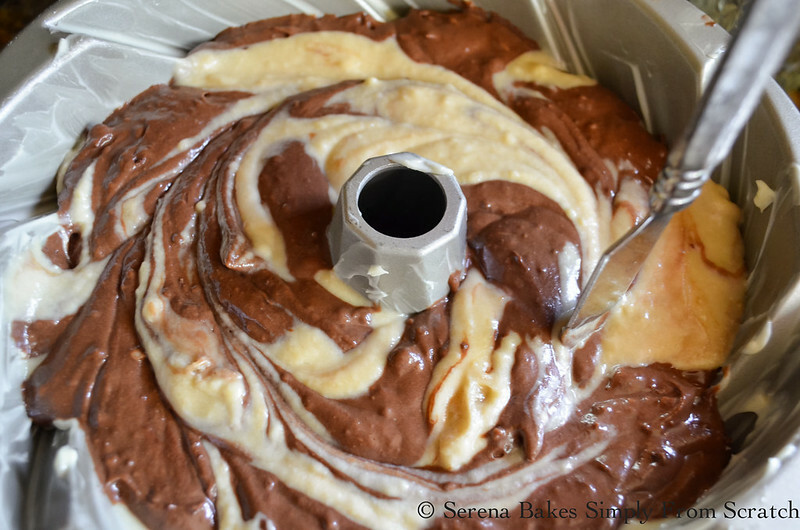 Vanilla Chocolate Marble Cake happens to be one of my favorites and I haven't made one in forever so I thought this was the perfect time to share my favorite Buttermilk Marble Bundt Cake I perfected over the years. It has a moist crumb, lots of chocolate flavor and easy to make glossy chocolate glaze. Colt ate 3 pieces trying to get a photo perfect slice or at least that was the excuse he gave me. I was barely able to get him to share a bite with me. I pay him in food in exchange for food photo's and help in the kitchen. It's a pretty good deal if you ask me! 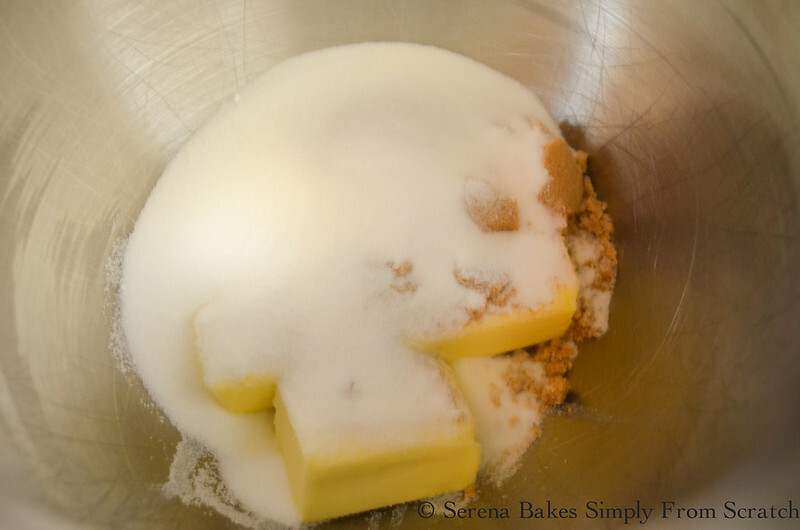 Cream together 3/4 cup Cold Butter, 1 cup Granulated Sugar and 2/3 cup Brown Sugar until light and fluffy. 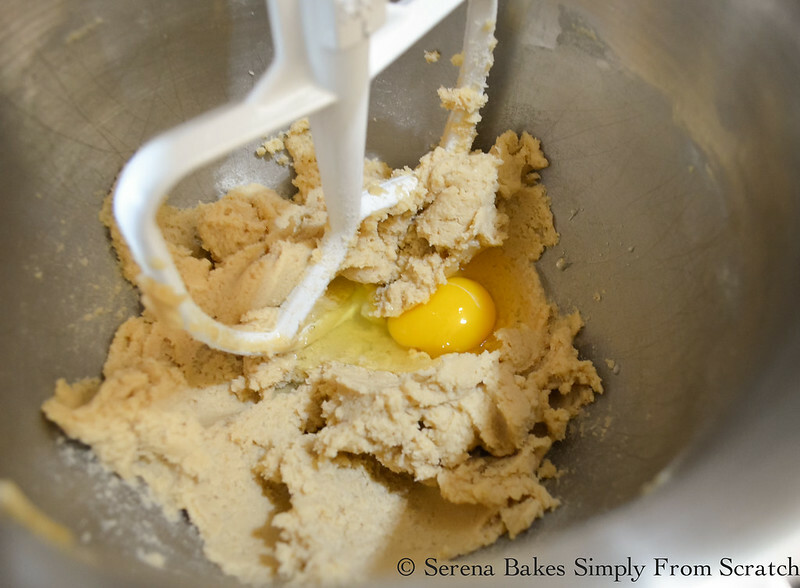 I find the cold butter adds better volume to the batter. 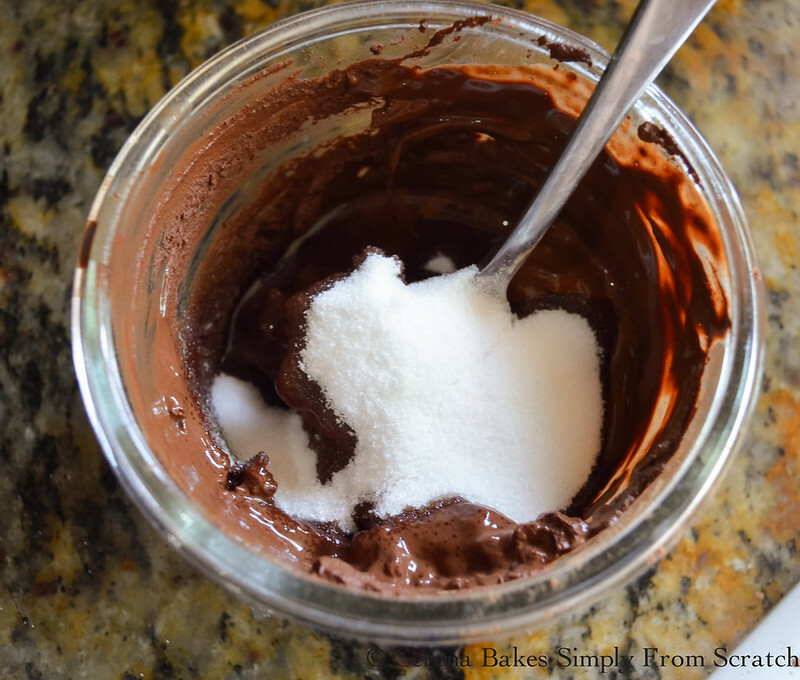 Add 1 tablespoon Pure Vanilla Extract, 2 teaspoons Baking Powder, 1/2 teaspoon Baking Soda and 1/2 teaspoon Sea Salt. Mix until well combined and scrape sides of bowl. Add 2 1/4 cups All-Purpose or Whole Wheat Pastry Flour (make sure to fluff flour so it's not compacted) and 1 1/2 cups Buttermilk. Mix until combined being careful not to over mix. In a medium sized bowl combine 2/3 cup Cocoa Powder, 5 tablespoons Hot Coffee and 2 tablespoons Sugar until cocoa powder is dissolved and well combined. Stir in 2 cups of the yellow buttermilk batter into cocoa powder mixture and stir until well combined. Grease a 10 cup bundt pan well using butter. Place about 1/4 of the yellow buttermilk batter into the bottom of the pan. Then alternate dropping the yellow buttermilk and chocolate batter into the bottom of pan. No need to be perfect it will all work out in the end! Using a knife make a continuous S shape running from the inside to the outside of the pan and then run the knife in 3 circles around the pan to form swirls of yellow buttermilk and chocolate. Gently tap cake to dislodge any bubbles. Bake in a 350 degree oven for 35-45 minutes or until a toothpick or skewer inserted into the center of cake comes out clean. Allow to cool 15 minutes before inverting onto a cooling rack and removing from pan. In a small saucepan heat 1/2 cup Heavy Cream until hot. Add 2 teaspoons Corn Syrup and 3/4 cup Semi-Sweet Chocolate or Dark Chocolate Chips. 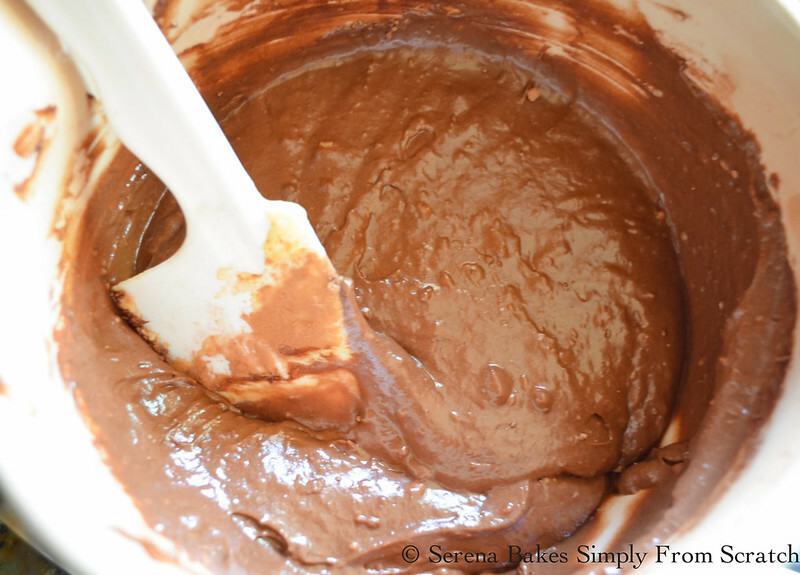 Stir until chocolate is melted and allow to cool for 30 minutes to thicken. Drizzle Chocolate Glaze evenly over cake. And since it's cake I figured one more picture wouldn't hurt since to get this shot it required Colt eating 2 slices first and then this one! It was well worth his patience and understanding as I tried to explain to him my vision and the numerous plating options we went through to get these shots! 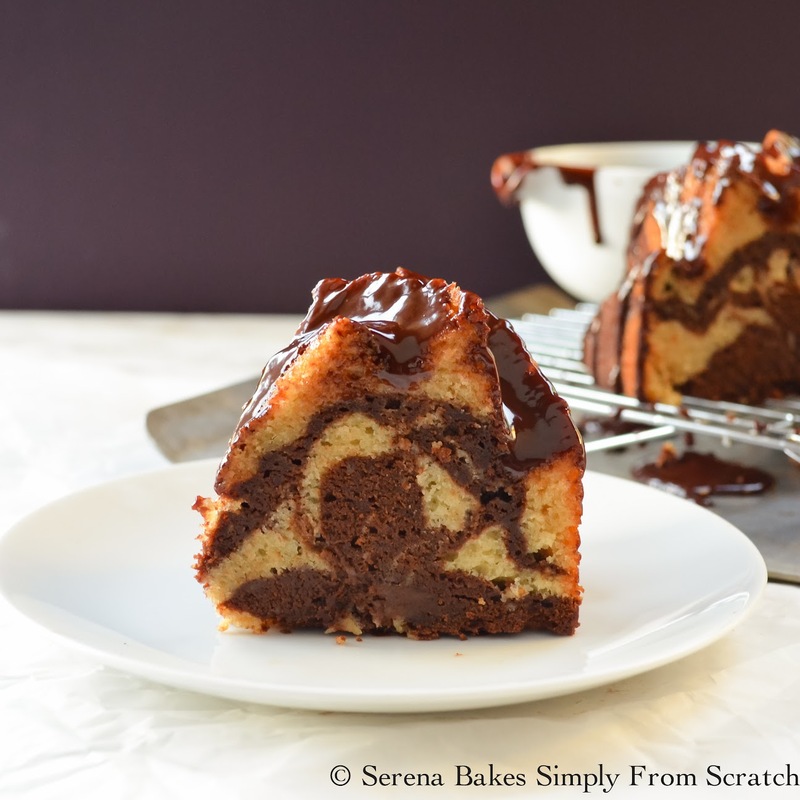 Moist Buttermilk and Chocolate Cake marbled together and then drizzled with a glossy chocolate glaze with easy to follow step by step instructions with photos from Serena Bakes Simply From Scratch. Preheat oven to 350 degrees, and butter a 10 cup bundt pan. Cream together cold butter, 1 cup granulated sugar, and brown sugar, until light and fluffy. Beat eggs in 1 at a time mixing well between each addition. Stir in vanilla, baking powder, baking soda, and sea salt. Mix until well combined. Add all of the flour and buttermilk. Stir until combined being careful not to over mix. In a medium sized bowl stir together cocoa powder, hot coffee, and remaining 2 tablespoons of sugar, until cocoa powder is dissolved. 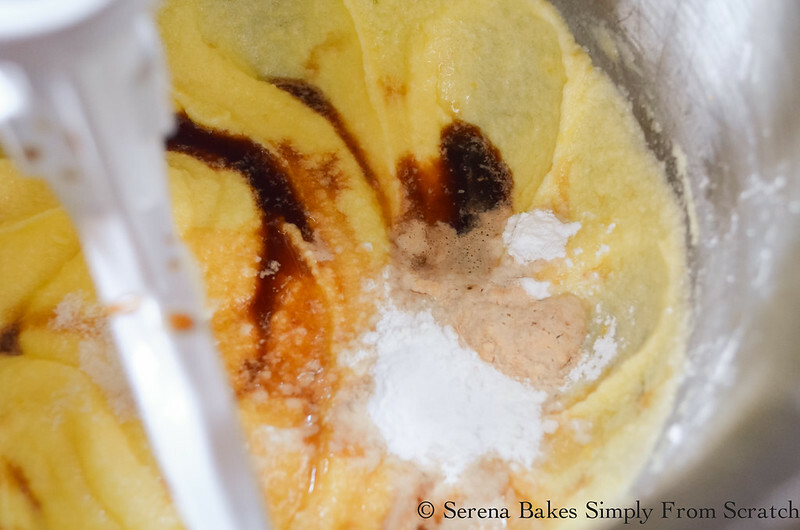 Take 2 cups of the yellow buttermilk cake batter, and mix into the cocoa powder mixture, until well combined. 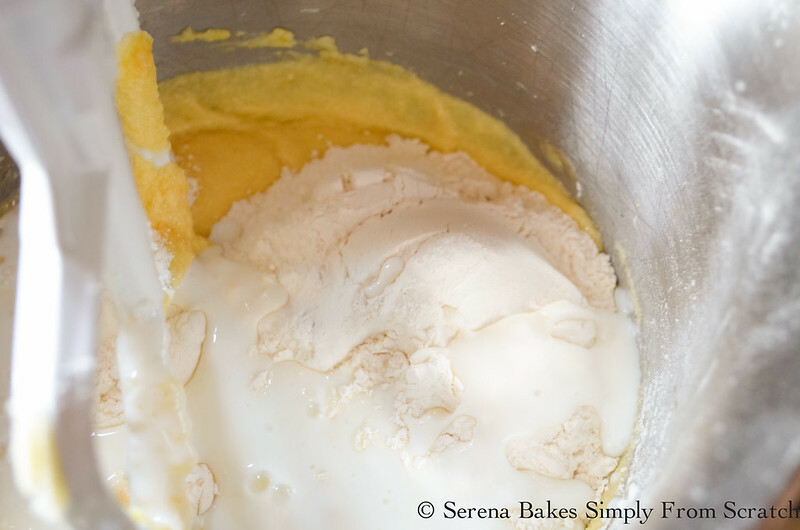 Place about 1/4 of the yellow buttermilk batter into the bottom of the cake pan. 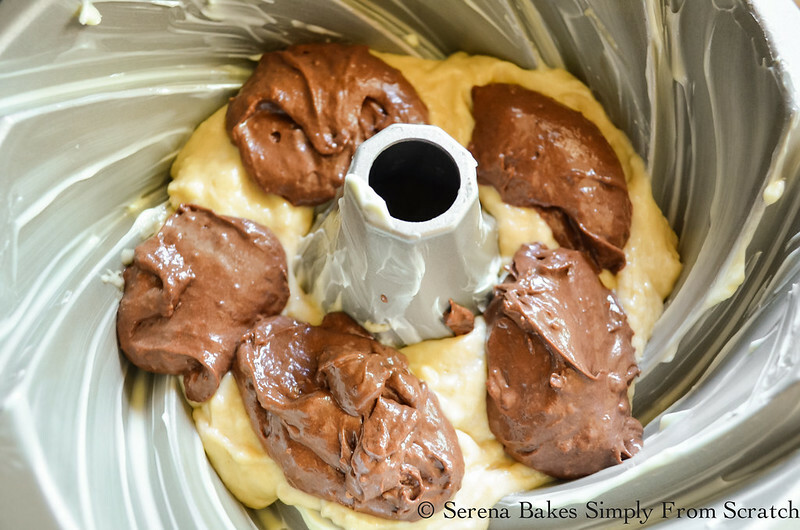 Then alternate between the chocolate batter, and the yellow buttermilk batter, until all batter has been used. Using a knife make a continuous S shape running from the inside to the outside of the pan, and then run the knife in 3 circles around the pan to form swirls of yellow buttermilk, and chocolate. 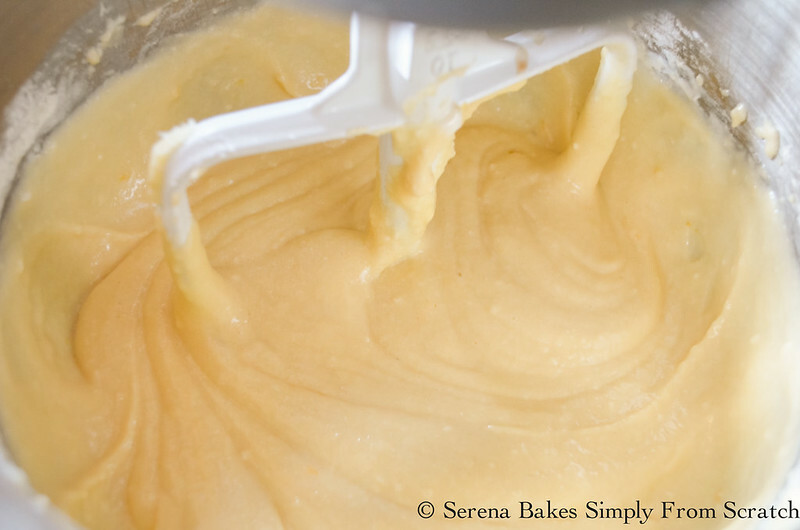 Bake for 35-45 minutes or until a skewer inserted into the deepest part of the cake comes out clean. Allow cake to cool for 15 minutes before inverting over a cooling rack, and removing pan. Cool completely. In a small saucepan heat heavy cream until hot. Remove from heat. Stir in corn syrup, and chocolate chips, until chocolate is melted. 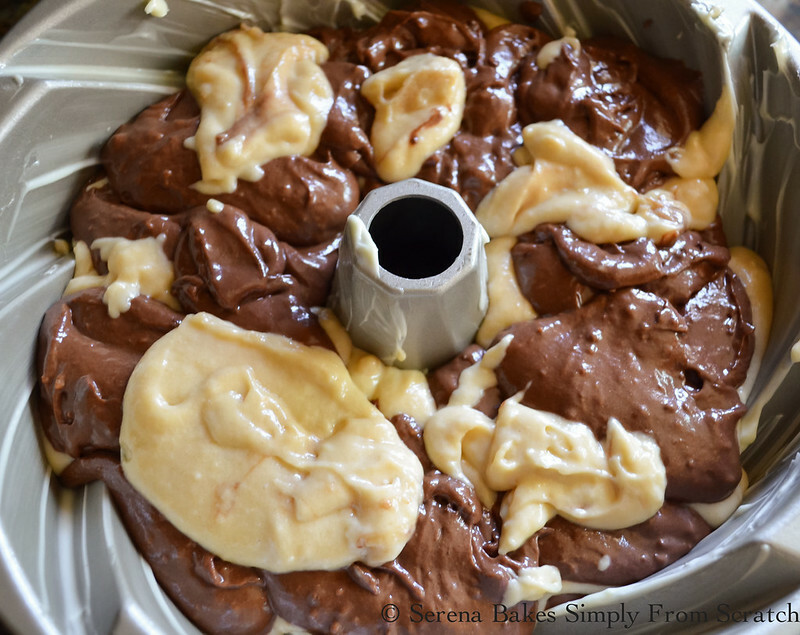 Allow chocolate glaze to cool 30 minutes to thicken, and then glaze cake. What a wonderful cake! It looks really moist and soft and I also love your baking tin. It makes the cake look very pretty. Nice recipe! Beautiful pictures, Serena, love this cake! Wow, what a show-stopper! This cake rocks Serena - love it! Great looking cake. Love the swirl in the cake. Anything with chocolate and count me in. This cake looks so tempting. Is it necessary to use that much sugar? I am trying to reduce sugar intake and this seems excessive. 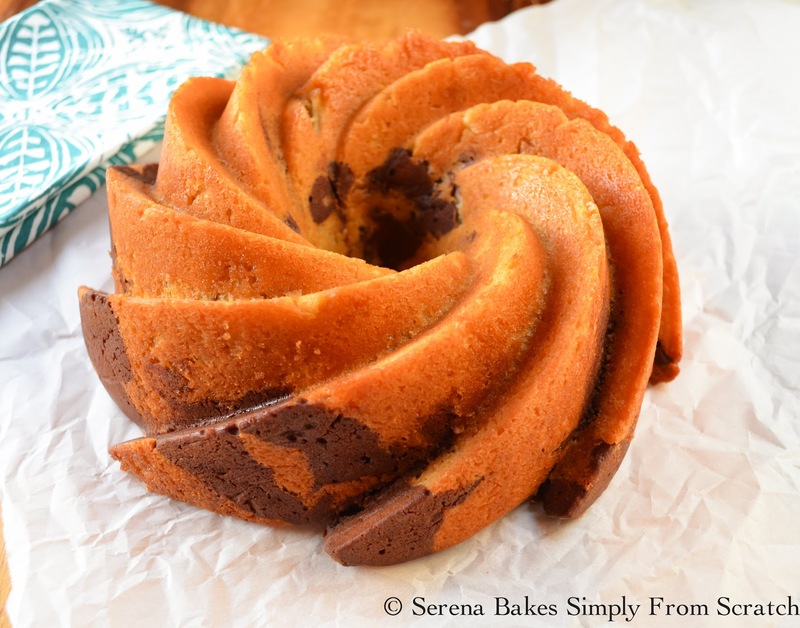 Love the cool bundt pan too! This looks amazing, love the chocolate glaze! This is the best cake I've seen!! Love this so much! You have great recipes. What a stunning cake! And that chocolate glaze ... YUM! Look's beautiful, I will make it today for sure.Tanks for sharing. Chocolate cake batter proportions are way off. So bitter and so stiff,could not mix with spoon until vanilla batter was added. I added at least double the sugar and hot water to gain desired consistency and taste. Cake in oven now and I am optimistic! To Severine Poul...I whisked my flour to lighten it up as it does say to fluff. Final product after tweaking chocolate batter was great. Nice moist crumb! This is the prettiest bundt cake ever! Love your mold and that chocolate drizzle has my heart! Will this work for cupcakes? This is one of the best cakes I've ever baked. I made a few changes though.I added baileys instead of coffee and I didn't use any sugar in the glaze, I substituted it with honey. I also added a bit more flour and I baked it 10' less. Greetings from sunny Athens. Like others above, I had the same experience with the cocoa mixture being too stiff, yet the remaining white mixture was a little too runny. Less cocoa might help. I added a quarter of a cup more sugar to the chocolate batter because it tasted too bitter. I too have the cake in the oven as I write this so we'll see how it turns out. Overall, I think it needs a bit more sugar, and it definitely needs that extra quarter cup of flour added to the remaining white batter.